The first review of the year! Writing this one always feels fresh and hopeful to me and like it may set the tone of my reading year in a way. This was a very good one to start with. And the moral of this story appears to be: I will never tire of Beauty and the Beast retellings. 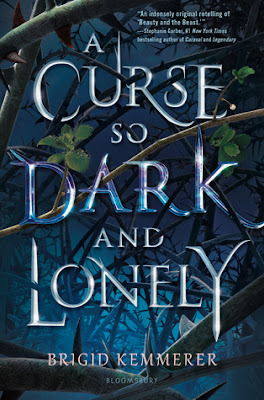 A fact I was not unaware of, but that I am happy to have confirmed once more, this time after reading Brigid Kemmerer's A Curse So Dark and Lonely. My favorites tend to run the Robin McKinley way, with the most recent favorite retelling being Meagan Spooner's wonderful Hunted. But this is the first retelling of my favorite fairy tale that I've read that includes both traditional fantasy and modern contemporary settings. I didn't think it could work. Or, at least, I was skeptical that the one would interfere with the other or that the different dialogues might clash. How happy I was to find that the whole thing played out seamlessly. How happy I am to have discovered Brigid Kemmerer's writing full stop. I have one of her contemporaries sitting on my nightstand now, and I'm looking forward to diving in. I can remember my own arrogance. I want to walk out of the castle and fling myself off a cliff. That doesn't work. I've tried. More than once. I always wake up here, in this room, waiting in the sunlight. The fire always burns low, just as it is now, the flames crackling in a familiar pattern. The stone floor appears freshly swept, wine and goblets sitting ready on a side table. Grey's weapons hang on the opposite chair, waiting for his return. Everything is always the same. Except for the dead. They never come back. Prince Rhen longs for death. He has lived the same tragedy over and over again, too many times to count, too many lives lost at his own hands. But the curse prevents him from staying dead, no matter how many times he tries. He always comes back. His loyal guard Grey at his side awaiting orders. The castle as beautiful and enchanted as ever, the season ready to start anew. And another poor woman's life is at risk as she is abducted and brought to his dark home to be a pawn in the endless game to break the curse. But this time, Grey returns with someone unexpected. A young woman who spotted him attempting to abduct another woman and who stepped in to stop him. Rather violently so. And Grey was forced to bring the wrong girl back. Both he and Rhen are uncertain what to do with her. For her part, Harper is spitting mad and on extremely uneven ground. Not only does she find herself magically transported to a foreign land, but she is expected to play a part in the mysterious attempt to save a strange man's life as well as his kingdom. Meanwhile, she is desperate to return home where her mother is dying and her brother is forced into a life of crime to pay back their wastrel father's debts. Somehow, she will get to the bottom of the ominous curse and make a deal with her captors to return home before it's too late. I loved Harper from the first swing of her tire iron at Grey's head. Because with that instinctive, intentional swing she changes the story. She becomes an active agent in a would-be abduction. And with that protective action, she hurls herself into her new story. Harper is scrappy and determined and has fought her entire life to be independent, despite her struggle with cerebral palsy and her father abandoning them to pay for all of his mistakes. And so, if she doesn't exactly hit the ground running as a stranger in a strange land, she manages to find her footing remarkably well. She will be no one's pawn. And she consistently defies the prince's orders to stay in her room and not stray from the castle grounds. She demands Grey teach her to throw knives, and she rides out beyond the grounds to take food to Rhen's starving people and find safe havens for stranded children. It is no wonder Grey forgoes his normally stoic manner to teach her to fight. It is no wonder Rhen finds himself entertaining, one last time, the possibility of an end other than his own. I became so enamored of this unlikely trio—the prince, the guard, and the girl who could save them all. Brigid Kemmerer takes all the time she needs to let them unfold the story at their own pace. There is no instalove here. There is no inexplicable, immediate falling together. Harper and Rhen aren't drawn to each other at first or even twelfth glance. They are two unwieldy and unwilling partners in an impossible bind. And ever so slowly they find a way to move forward side by side rather than entwined. Harper discovers the extent of Rhen's curse bit by bit, hidden chamber by hidden chamber. Rhen is loath to reveal the truth behind his transformations into a beast, and his repeated failures loom heavy in the specters of all the women whose lives he ruined. And linking them together is Grey, the only one who stayed when the curse was cast over his prince and his land. Grey's expression has no give to it now. This isn't the man who charmed smiles out of children in the snow. This isn't even the man who spoke passionately of honor and duty in the hallway. This is the lethal swordsman who kidnapped me. This is the scariest Grey of all. These three distinct individuals, they aren't the bendable kind. I loved their burgeoning friendships. I loved the long loyalty that ties Rhen to Grey and how I couldn't tell where it would go or how it would end. It wasn't until the final pages that I realized how tangled those ties actually were, and it's going to take at least one more book to follow the three of them down the dark path that opens up at the end of this one. But no matter how long it takes, I am for them. I really just brought you here to protect you." My pride flinches. "It is I who should be protecting you." "You've been doing that for a while. Maybe it's my turn. 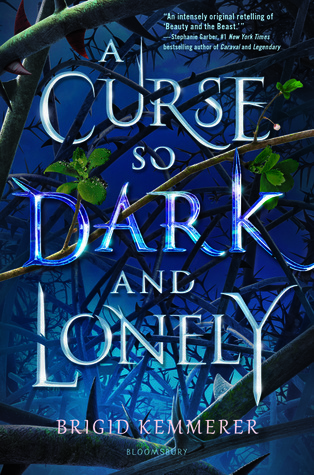 A Curse So Dark and Lonely is due out January 29th. Oh man! Great review! I promptly put this on my wish list. I love a Beauty and the Beast retelling. Robin McKinley's is my favorite. Thanks, Lin! I know. They are my Kryptonite. And no one surpasses Robin McKinley. But I thought this one was super fun and different. It is lovely, isn't it? That was the first thing that reeled me in. I have no resistance either, Tasha. Bring me all the B&tB retellings. All of them. I'm glad to see you liked this one! I love B&tB retellings to, and I've enjoyed quite a few of Brigid Kemmerer's books. I'm so excited to read more by her! I have LETTERS TO THE LOST on my nightstand just waiting.